“Most of my work is about beauty” says American photographer Lola Flash. Asked what she means by beauty, she replies: “beauty for me is an idea of being proud and strong”. Flash has been a celebrated artist since the 1980s. She came of professional age during the HIV crisis and joined a wave of ‘visual activism’ that was helping LGBTQ+ people to gain confidence and pride. From 2001, she spent 12 years in the London, developing the large-format colour approach to photography that has characterised her work since that time. After completing and MA at the London College of Printing, she stayed on to take pictures across the city, including many in East London. 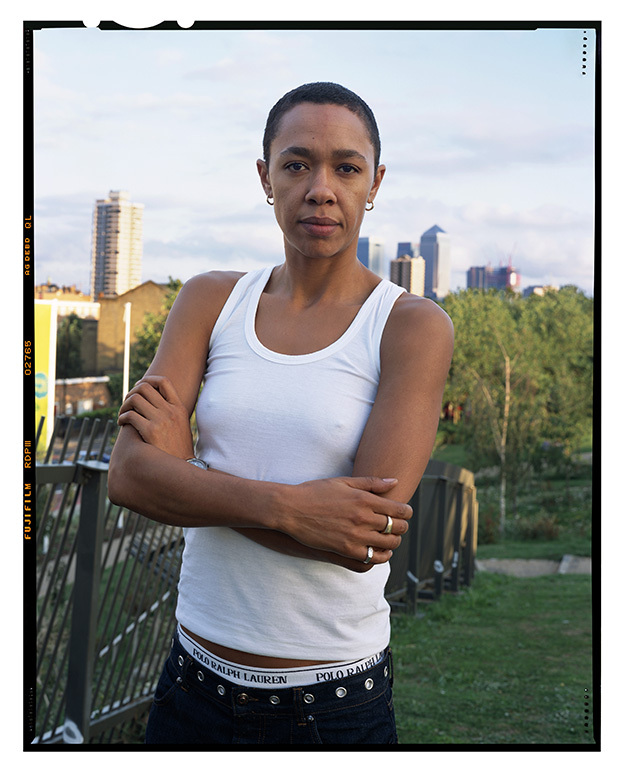 Her work is known especially for emphasising fluid and ambiguous aspects of race, sexuality, and more recently age. She is currently planning a new series of photographs called ‘incarcerate’ that will probe the identities of prisoners in the US. The Citizen caught up with Flash when she came to Hoxton on Monday evening (23 July) to give a talk at Autograph ABP gallery. For her this event was clearly a homecoming of sorts. Soft-spoken and courteous, she radiated manifest joy at seeing old friends in the audience. HC: Your work is known for challenging stereotypes; how have the stereotypes you are interested in evolved over the last 30 years? LF: I’d say that stereotypes have shifted ever so slightly over the last 30 years. Overall, although we have become more visible, in the media, and have gained the right to marry, in many countries – there is still a huge disparity between those in power, who are ultimately the ones who are making legislation and decisions, which don’t always have the best connotations attached. HC: Has your approach to photography been affected by social change? LF: The themes concerning my identity have remained the same (sexism, racism, homophobia). Though I am now also including trans folks, in solidarity. HC: With LGBTQ+ identities now widely accepted in mainstream society, what role does photography play in addressing cultures of gender and sexuality? LF: I was not aware of our community being “widely accepted”, as this is not the case in America. Many are still being abused, not hired and killed due to being part of the LGBTQ+ community. “Some legislation has changed to be more inclusive but attitudes are not where I had hoped them to be, in the 21st century. Yet, I’m quite excited about the youth. “They are clearly much more open to diversity, and lack the need for labels. They have more blended friendships, and in this openness, I can definitely envision a more fair society that will actually welcome difference. “With the aforementioned, in mind, my focus on exposing my communities in a positive and beautiful manner, is still my lifelong endeavour! I am dedicated to helping eradicate the negative stereotypes that continue to haunt us! HC: Can images change attitudes? LF: Yes, definitely images can change attitudes. Growing up, I never saw images of people that looked like me, dressed like me or spoke like me. What I remember is girls with blonde hair in dresses, and impoverished people of colour. Neither of these codes reflected my experience, and I felt invisible. “So, herein lies the purpose of my work, to enable marginalised folk a way of seeing the glory of themselves, sometimes larger than life and always in full colour. As a coda, she points to the artist statement on her website, where one sentence in particular stands out: “Flash’s work welcomes audiences who are willing to not only look but see”. Lola Flash: Photography, Pride And Queer Visual Politics by Autograph ABP took place on Monday 23 July 2018.